Today in a ceremony in Manhattan, academics posthumously honored longtime Georgetown University professor Jan Karski, a man who tried to prevent the Holocaust by sharing the truth. Alas, politicians among the Allies were tardy to act of the news from Karski as the Messenger from Hell. During the Second World War,I Karski was a Second Lieutenant in the Krakow Valvary Brigade who was captured after the battle of Tomaszow (1939) by the Russians. But due to Karski's birthplace, the Russians handed him over to the Germans, thus he avoided being a victim of the Katyn massacre of 1940. Karski escaped his German POW train in 1939 and escaped to Warsaw where he joined the Polish Resistance movement. Larslo organized courier missions to the Polish Government in exile headquartered in Paris andhe himself made several secret trips to France and Britain. Karski was eventually captured by the Gestapo and tortured in Slovakia but was later smuggled out and rejoined the Polish Resistance. In 1942, Karski was selected by Polish Prime Minister in exile Władysław Sikorski to go on a secret mission to gather first hand information about the Nazi atrocities in occupied Poland. Karski was smuggled into the Warsaw Ghetto. Karski also sought to infiltrate the Belzec death camp as an Estonian guard. Although Karski only managed to see a transit station, the horror that he witnessed first hand was appalling. After briefing the Polish Government in exile upon his return to London in 1942, Karski met with other exiled Polish politicians and British Foreign Minister Anthony Eden about his first hand testimony about the Holocaust. In June of 1943, Karski traveled to the United States to personally brief President Franklin Roosevelt, as well as other American civic and government leaders, including Secretary of State Cordell Hull and Associate Supreme Court Justice Felix Frankfurter, without much effect. Karski published his recollections Courier from Poland: The Story of a Secret State (1944) which sold more than 400,000 copies. 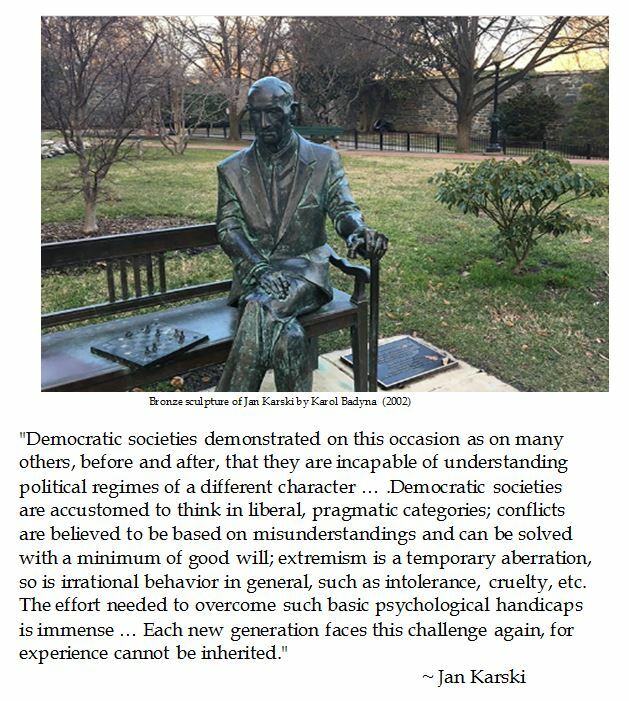 Eventually Jan Karski settled at Georgetown University, eventually earning a Ph.D in 1952 and taught there for over forty years. Georgetown remembers Jan Karski as many things — a beloved professor, writer, and colleague, to name a few — but to the world, he was known as one of the first to warn Western powers of the horrors of the Holocaust. Although Karski was a Roman Catholic, he felt a profound connection with the people whose lives he attempted to save from the Holocaust. In 1981, Karski said: “All murdered Jews became my family. I am a Christian Jew.” In 1982 Karski was recognized by Yad Vashem as Righteous Among the Nations. In 1991, he received the Wallenberg Medal from the University of Michigan for his outstanding humanitarian efforts. In 2012, President Barack Obama posthumously awarded Jan Karski the Presidential Medal of Freedom for his heroic witness to the ugly truth of the Holocaust. Mr. Obama proclaimed: "Jan Karski -- a young Polish Catholic -- who witnessed Jews being put on cattle cars, who saw the killings, and who told the truth, all the way to President Roosevelt himself." Karski's faithful witness has been remembered from murals in Warsaw to a series of five bronzes of Karski sitting on a bench playing chess created by Krakow sculptor Karol Badyna which are located in Georgetown, Manhattan, Lodz, Warsaw, Keilce and Tel Aviv University in Israel.